I am heading down (or is it up?) 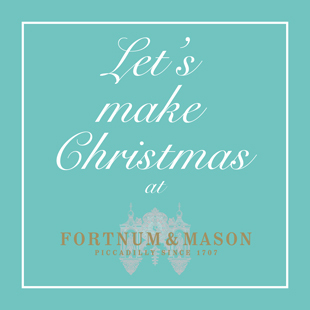 to London on Friday for the ‘Let’s Make Christmas’ Blogger Gift Swap at Fortnum and Mason arranged by Vanessa Kimbell. Each year my Mum used to take me Christmas shopping in London on the train. We finished the day at the theatre watching something like West Side Story or Singing in the Rain. It will be nice to wander around our old festive haunts like Liberty of London and of course Fortnum and Mason. It was Ed that suggested Christmas Pudding would be a good thing to offer as a gift, because it is easily portable and can happily sit around until Christmas instead of being devoured in November. I had also written in my post ‘List for Christmas Future’ that we only needed one of the two that the recipe made, so I should getting into the Christmas spirit by giving one away. I do worry that it may not quite fit into the category of ‘baking’ though – because it is steamed. Hey ho! It will still make a nice gift for someone and I have one to keep for our Christmas Day. I am gradually coming round to all the Christmassy stuff that I hated as a kid, because I am doing it my way. I now have a version of mince pies that I am happy with. The only big thing left to conquer is Christmas Cake. ‘No peel, No pip, a-little-bit-cherry-and-chocolatey Christmas pudding’. Stir the Fruity Bit together in a large bowl and let it mingle and smell delicious for 24 hours. Stir in the Other Stuff. That’s it! Your Christmas Pudding is made. Isn’t that fabulous? There’s the small task of steaming it…but that’s the basic mix. I have decided on a new regime for mine that I steam it at Halloween then let it mature until Christmas, but there is no absolute need to do this, it will be fine if you make it later. Smear butter into a 2pt/lb pudding basin, or as I prefer 2 x 1pt/lb bowls. Sprinkle the buttery surface with the 2tbsp of muscovado sugar. Cover with a layer of greaseproof paper with a piece of foil on top, tied on with string and with a pleat across the middle for expansion. Sit it/them in a steamer (or a large pan with an upturned saucer in the bottom) so that the water comes half way up the bowl. Let them simmer for 5 hours for a 2 x 1lb or 6 hours for 1 x 2lb puddings. When cool removed the paper and foil and re-cover with a fresh layer of foil. Either steam for an hour (yeh right) or microwave for 10 minutes or so on medium. Serve with brandy butter and cream. 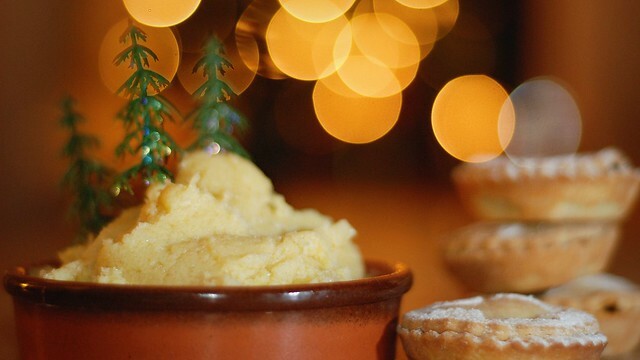 Here is my Brandy Butter Post from last year with festive photos. PS – I am also entering the preserves category too with a selection pack of Damson Jam, Pretty Pear Jelly and Green Tomato Chutney, but I have blogged them already and they are happily maturing in the jars, so all you get is a photo. See you on Friday Gift Swappers! Oh wow, stunning and two entries – you mean business! I love the actual ingredients of your Christmas pudding, I am not a fan of peel or pips so the recipe itself is perfect for me. I hope I win it! Someone will be very happy though, whoever wins it. I also love the pretty preserves. See you on Friday! ah, thanks Ren, see you Friday! Wow, this looks so amazing. I know this is common across the pond, but you just don’t see a lot of Christmas puddings in the states. Love that first photo. We have a silver start that’s similar. My parents got it for us in Germany. I have never been into the pudding since I made this one last year, but do have it with brandy butter….my, it’s a real festive treat. I have a garland of those silver stars too, lovely aren’t they. This post has made me feel Christmassy WAY to early! Now is the time to be making such things and it always passes me by, leaving me wishing at Christmas that I had made a booze soaked pudding in November. Thanks for the reminder and inspiration, this year I’m going to do it! Yay! Do it. It is so much easier and nicer than I expected. this looks absolutely delish and stunning – thanks for sharing 🙂 I’m definitely going to give your pud a try for Christmas. My husband can’t eat nuts so it’s always a bit of a nightmare when it comes to buying Christmas desserts – I often have to resort to making my own (which I secretly love doing anyway). Absolutely gutted that I can’t make the Fortnum gift swap event, I was in there last Friday and their mini mince pies are gooood! – hope you have a lovely Christmassy time. Wow! It all looks gorgeous! I shall be honoured if I land the lucky prize of taking home this pud! That pudding looks great. I too hate peel and raisins. I really want to make a christmas pudding this year, even though I’ve never actually tasted one that I like, but I think this could be the answer! Looking forward to meeting you at F&M later today. That looks great. It was a real rush to finish my entries for this. Crazy but fun. At long last someone else who loathes candied peel. AND, a pud with no bits of nut in it either!